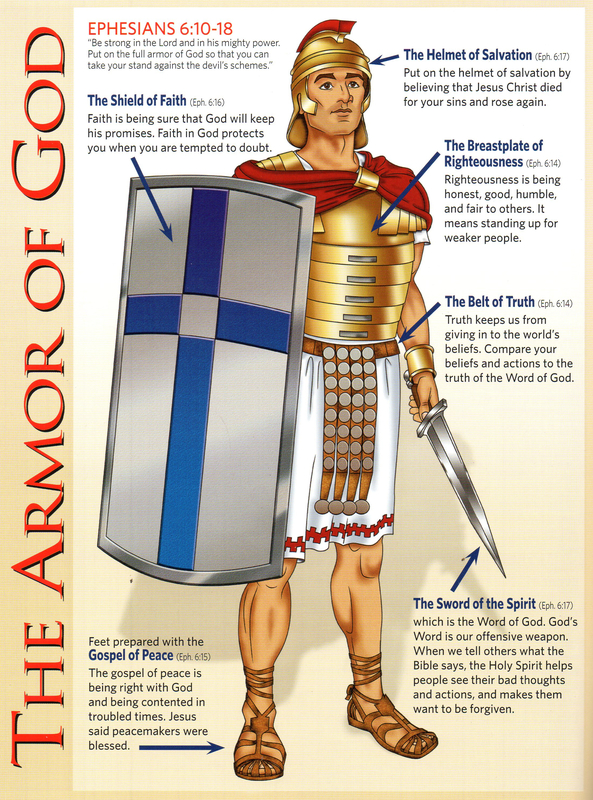 The armor of God illustrates protective gear that soldiers wear to survive combat. Ephesians 6:12 (in the King James translation) which says "we wrestle not against flesh and blood, but against principalities, against powers, against the rulers of the darkness of this world, against spiritual wickedness in high places" shows that Christian values are under attack. To stay strong, we need to continuously read the Bible and yield to the leading of the Holy Spirit. Scripture makes reference to the various armor pieces throughout the Bible. Isaiah 59 gives an initial example of the armor even though armor had been in use for a while by then. 10. Finally, be strong in the Lord and in his mighty power. 11. Put on the full armor of God so that you can take your stand against the devil's schemes. 12. For our struggle is not against flesh and blood, but against the rulers, against the authorities, against the powers of this dark world and against the spiritual forces of evil in the heavenly realms. 13. Therefore put on the full armor of God, so that when the day of evil comes, you may be able to stand your ground, and after you have done everything, to stand. 15. and with your feet fitted with the readiness that comes from the gospel of peace.